Lord, who shall be admitted to your tent and dwell on your holy mountain? And so began Psalm 15 from the Common of Pastors on this optional memorial of St. John Eudes. As I read the first few verses, a friend, teacher… and deacon came to mind; Dc. Myron Kotch. We received news of his passing this morning from the Office of the Permanent Diaconate in the Diocese of Syracuse in a brief email. I first met Deacon Kotch… Myron to most in our first year of deacon formation: History of the Early Church. And what a history course it was! 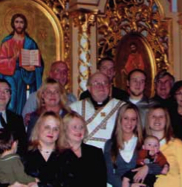 Dr. Kotch, an Eastern Rite Deacon, brought a depth and breadth of knowledge as a teacher and mentor to those classes. In his enthusiasm for the Church, both East and West, he pushed us to embrace the best of both worlds; always helping us to see what each brought to the faith. And could he assign homework! The groans were tangible as he ended each class with a long list of questions to be written out in preparation for the following month’s class. Dc. Kotch was ordained to the SubDiaconate at the Martyrs’ Shrine, Auriesville, in July 1982 and to the Diaconate in October of that same year at St. John the Baptist Ukranian Catholic Church in Syracuse. Perhaps the highlight of knowing Myron came in our 2nd or 3rd year, when a number of us attended Divine Liturgy at St. John’s in Syracuse. All that we’d learned about the essential role of the Eastern Rite Deacon in liturgy played out before us in that awesome celebration, with Dc. Kotch there to example for us. For a group of Roman Catholic deacon candidates, the experience helped to move us into a deeper appreciation for the roots of the early Christian Church and the incredible depth of liturgy. After the liturgy, we enjoyed a sumptuous Eastern European dinner in the church hall. Gracious, kind and welcoming… who could expect anything less from Myron and the faith he embraced: friend, teacher and deacon mentor. I first met Dc. Myron Kotch long before his ordination, when I was a freshman at CBA. Throughout the years, we became friends. I was present at his ordination, and later, when I began serving as Cantor at St. John the Baptist, he served as Deacon at my first liturgy. Throughout the years, he was always there, opening his heart and his home to me and my family. He truly exemplified God’s love in the 36 years I knew him.